In this summer of our national discontent there is no safe haven from the evils of white privilege and institutionalized racism. The nation’s preeminent cable sports network ESPN is prepping for the upcoming kickoff to the NFL season by raging against white privilege and institutionalized racism because there aren’t enough black coaches on the sidelines. The network has been on the cutting edge of merging sports coverage and liberal commentary and seems to be slipping very nicely into a new role as cultural crusaders in a nation that is already being throttled by political correctness Nazis and persecuted by the forced diversity police. The NFL has sponsored programs, implemented the Rooney Rule, counseled team owners and convened committees to address its diversity problem in the coaching ranks. None of it is working. Minority coaches are frustrated. The numbers explain why — emphatically. Teams have taken a chance on 21 first-time white head coaches and only one first-time minority head coach, Todd Bowles, over the past five hiring cycles (2012-16). The gap was an identical 21-1 nearly two decades ago, when the New York Jets made Herm Edwards the only first-time minority hire from 1997 to 2001. It’s as though team owners have reverted to previous form, undoing the historic gains driven by Tony Dungy and his coaching tree in the early 2000s. 80 of the NFL’s current 85 offensive coordinators, quarterbacks coaches and offensive quality control coaches are white, including all 37 with the word “quarterback” in their titles. 23 of 32 defensive coordinators are white. Those are crushing numbers for minorities considering how the hiring game is played: 94 percent of head coaches hired over the past 20 years (133 of 141) had been NFL coordinators, pro head coaches (including interim) or college head coaches previously. The path to becoming an NFL head coach is clear. It is also largely unavailable to minorities, especially with Dungy in retirement. Dungy and his former assistants accounted for 43 percent of minority head-coaching hires over the past two decades and 39 percent since the Rooney Rule took effect. While it’s hard to argue that in comparison to the number of black players on the field that coaches of color are non-representative. There also should be a consideration of coaching acumen, performance history and the idea that some teams will sooner take a chance on a hotshot college coach than a retread but it’s always about race. The ESPN piece references the hallowed Tony Dungy whose NFL success was always over-inflated and in the opinion of some was exaggerated simply because he himself was black. Dungy rose to the mantle of national fame when he managed to coach the perennial doormat Tampa Bay Buccaneers back to respectability in the 1990’s. But as a longtime watcher of the Tampa Bay Buccaneers I can offer up my personal two cents that the Black Spock (as my old buddy Butch used to refer to him) was highly overrated during his tenure here. Despite having a nasty defense stocked with Hall of Famers, the best that Dungy could do was to make it to the NFC Championship game one time and was unable to coach a win out of his team despite holding the offensive powerhouse St. Louis Rams – the greatest show on turf – to a measly 11 points. Dungy’s playoff history in Tampa was nothing short of atrocious at 2 and 4 and he was fired after his team quit on him in a game it knew it had to win to save Dungy’s job. The Bucs turtled against the Philadelphia Eagles in a 31-9 debacle that was nowhere as close as the score indicated. Saint Dungy then went on to Indianapolis where despite having Peyton Manning in his prime for seven years managed only a 7-6 playoff record. There was that one Super Bowl win but that one should have an asterisk considering that Rex Grossman was the starting quarterback for the opposing team. 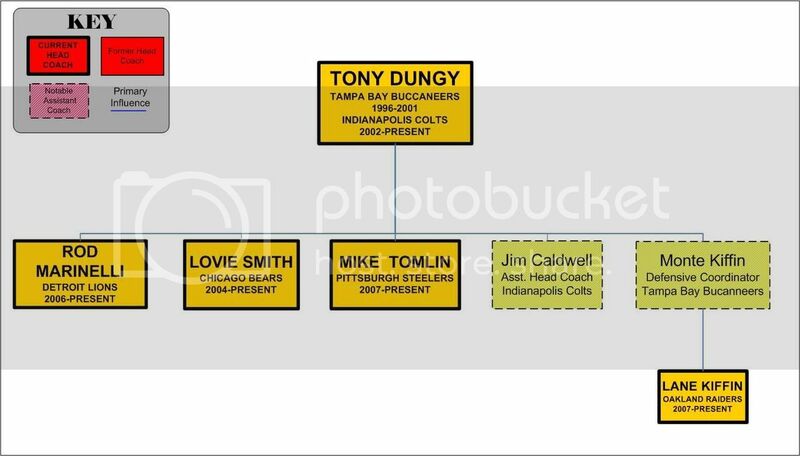 The Dungy “coaching tree” isn’t as successful as ESPN makes it out to be when you subtract out Pittsburgh Steelers coach Mike Tomlin – a two-time Super Bowl winner – with the only other member with any longevity being bumbling chump Lovie Smith who was fired by the Bucs last year after a late season collapse. ESPN’s story is very long and goes to great lengths to make it’s case but what it really is doing is helping to contribute to the deteriorating racial conditions in America in an era when Black Lives Matter thugs are running amok in the streets and police officers are being murdered just because they are white. The network should just stick to sports but nothing is sacred anymore.